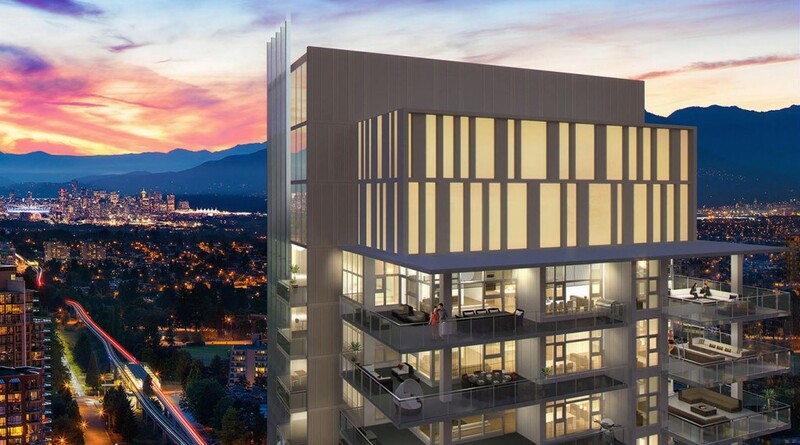 Despite a brisk sales program, a great selection of homes remain available at Burnaby’s anticipated Modello high-rise development. Homes such as the exclusive Plan H floorplan, which emulates one of the Grand Estate Collection penthouse layouts. As you can see from the floorplan below, the home spans the entire north side of the building, offering panoramic east-to-west views of the city and North Shore mountains via the floor-to-ceiling windows and two large terraces. Boasting over 1,300 square feet of indoor living space (as well as over 400 square feet of outdoor living), this two-bedroom, two-bathroom home offers the kind of room that you don’t usually find in a condo. The floorplan’s generous open living area is perfect for entertaining, especially with the seamless transition between the main living area and the covered outdoor space. The master bedroom is especially luxurious, as it provides access to the second covered terrace with room for a spacious seating area to enjoy year-round. It is also the only plan to include a grand ensuite bathroom with a shower, bathtub and double-sink vanity. Like all Modello homes, the Plan H also boasts wide-plank brushed walnut and oak hardwood flooring, over-height nine-foot ceilings, and Boffo Development‘s signature kitchen, complete with custom cabinetry, marble slab backsplash, under-cabinet and recessed lighting, a wine fridge and top-of-the-line Miele appliances. Modello is currently under construction in Burnaby’s ultra convenient and amenity-rich Metrotown neighbourhood. The level five podium was recently completed, and the following slabs will be poured on a weekly basis. This means that construction should be up to the 12th floor of the 37-storey development by the end of the year. To learn more about the Plan H home, or any other remaining unit at Modello, visit the presentation centre and display home at 118 – 5021 Kingsway (at Marlborough) in Burnaby. The facility is open from 12pm to 5pm Saturday through Thursday. For more information call 604 456 0688, email info@modellobyboffo.ca or visit the website here.